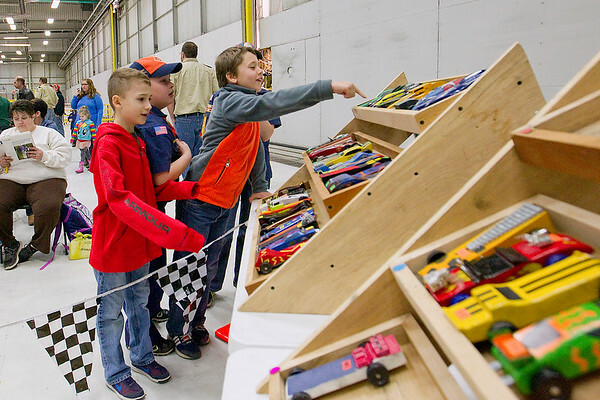 From left, Aiden Sgaraglio, 7, Kyle Gubbins, 7, and Deane Stuhlmueller, 7, check out the entries for The Bay Area Trails Council Regional Pinewood Derby on Saturday in the hangar of U.S. Coast Guard Air Station Traverse City. Over 150 Cub Scouts from 23 packs competed in the event, which pitted 5 ounce cars made by scouts from a kit against each other on the track. This is the sixth year the event was hosted by Pack 31 of Traverse City in the hangar of the air station, which also offered scouts and their families a chance to get a close look at the station's helicopters, meet service members and watch a demonstration.